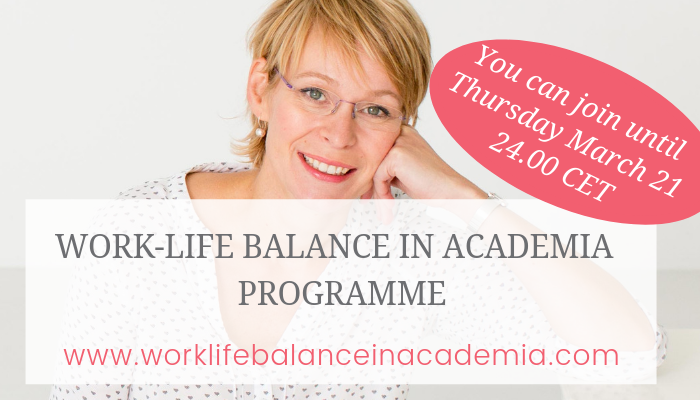 Work-Life Balance in Academia is a powerful combination of individual coaching, online & live training and peer group support. You are a driven academic who longs to make a difference with your work and at home. But at the same time you feel tired, overwhelmed or stressed and you struggle with feeling balanced. Maybe you think that a poor work-life balance is just part of what it means to work in academia. Maybe your struggle with balance makes you doubt whether you belong in academia. Maybe you feel that you have to make a choice between feeling balanced or living your ambitions. Work-life balance can feel daunting or even impossible when working in academia. Although finding balance in academia is no easy feat, it is certainly possible to feel balanced! You can make an impact in your work and private life and stay balanced along the way! And this progamme will give you the support and tools to accomplish both.